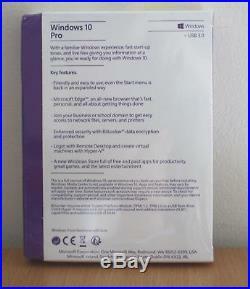 Microsoft Windows 10 Pro - Full Version New UK Genuine Retail Box (FQC-08789). FULL NEW SEALED UK COMMERCIAL BUSINESS LICENSED (NOT ACADEMIC) RETAIL BOXED VERSION. Genuine Boxed Microsoft Software - New Shrink-Wrapped Box. Certificate of Authenticity , ORIGIN : IRELAND, Microsoft Part Number FQC-08789 (this reference number indicates that this is a full commercial business license UK / EU commercial retail boxed version of Microsoft Windows 10 Pro - search the Web with this reference for competitors' prices). Installation Media is a USB Drive inside the sealed retail box. This is a genuine unused full uk commercial box product which can be registered with Microsoft. If you are a business the product is fully legal, and should you be audited by BSA (Business Software Alliance) or the likes you will not be fined for using illegal copies. Windows 10 is so familiar and easy to use, you'll feel like an expert. The Start Menu is back in an expanded form, plus your pinned apps and favorites are brought over so they're ready and waiting for you. It starts up and resumes fast, has more built-in security to help keep you safe, and is designed to work with software and hardware you already have. You can connect to your business or school Domain or Azure Active Directory to use network files, servers, printer and more. Get additional security with BitLocker to help protect your data with encryption and security management. Windows 10 enables you to log in with Remote Desktop to sign in and use your Pro PC while at home or on the road. Create and run virtual machines with Hyper-V so you can run more than one operating system at the same time on the same PC. Your apps in the Store. Windows 10 lets you create your own private app section in the Windows Store for convenient access to company applications. Windows 10 combines the Windows you already know and adds great improvements youll love. Let you boot up and resume quickly. And Windows 10 has more built-in security features than ever to help protect against malicious software. Multi-task like a master with the ability to snap four things on the screen at once. Create virtual desktops to get more space and work with just the items you want. Plus, all your notifications and key settings are collected on one easy-to-reach screen. Write or type directly on webpages and share your mark-ups with others. Youll like the reading view that clears away distractions. Theres also an improved address bar to help you find things faster. The best screen is always the one youre on because Windows 10 optimizes your experience for your activity and device. Onscreen features adapt for easy navigation and apps scale smoothly from the smallest to the largest displays. Your Windows 10 device recognizes you and acknowledges your presence in truly personal ways. With Windows Hello, your device greets you by name and lights up in recognition, waving you through log-in and freeing you from having to remember or type in a password. Play your Xbox One games on your Windows 10 PC, laptop or tablet. Use the Game DVR feature to record your greatest hero moves and send to your friends instantly, without leaving your game. Cortana is your truly personal digital assistant who works across all your Windows 10 devices to help you get things done. By learning more about you over time, Cortana becomes more useful every day, staying transparent and keeping your trust. Windows 10 Pro system requirements 1 gigahertz (GHz) or faster 32-bit (x86) or 64-bit (x64) processor 2 gigabyte (GB) RAM 20 GB available hard disk space (32-bit) or 20 GB (64-bit). 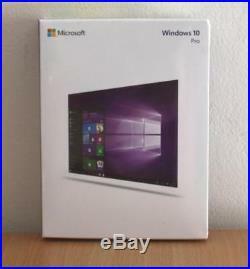 The item "Microsoft Windows 10 Pro Full Version New UK Genuine Retail Box (FQC-08789)" is in sale since Friday, June 8, 2018. This item is in the category "Computers/Tablets & Networking\Software\Operating Systems". The seller is "metrropolis" and is located in Ash Vale. This item can be shipped to all countries in Europe, Australia, United States, Canada, Brazil, Japan, New Zealand, China, Israel, Malaysia, Mexico, Saudi arabia, South africa, United arab emirates, Chile.